The Lily Pond. Homage by Hiramatsu to Monet will bring together twenty or so paintings that, made using the traditional nihonga technique, unite tradition and modernity. The exhibition will also present works by Claude Monet, and a selection of Japanese prints, from Hokusai to Hiroshige. Japanese art definitely exerted an influence on Claude Monet, as is made clear by his collection of Japanese prints, which can today be admired at Giverny. 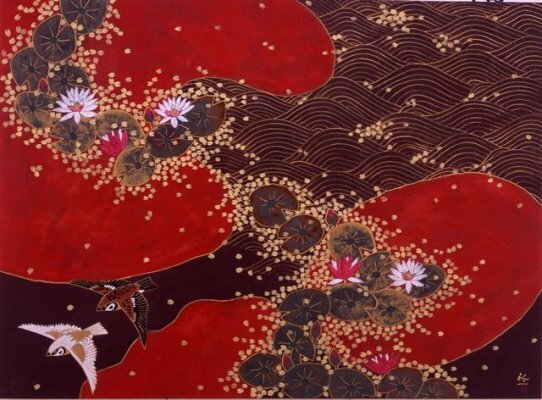 The exhibition “Hiramatsu, The Lily Pond. Homage to Monet” will demonstrate that, in the same way that Japanese prints were a way to introduce a new philosophy of space and light for the Impressionists, the canvases by Monet were a source of inspiration to Hiramatsu Reiji. Born in Tokyo in 1941, this Japanese painter visited Paris for the first time in 1994 and discovers the huge paintings “Waterlilies” at the Orangerie. And he took the opportunity to wander in the footsteps of the French master by visiting the garden in Giverny.